The heat wave is coming and we hope all our rabbits are staying cool! 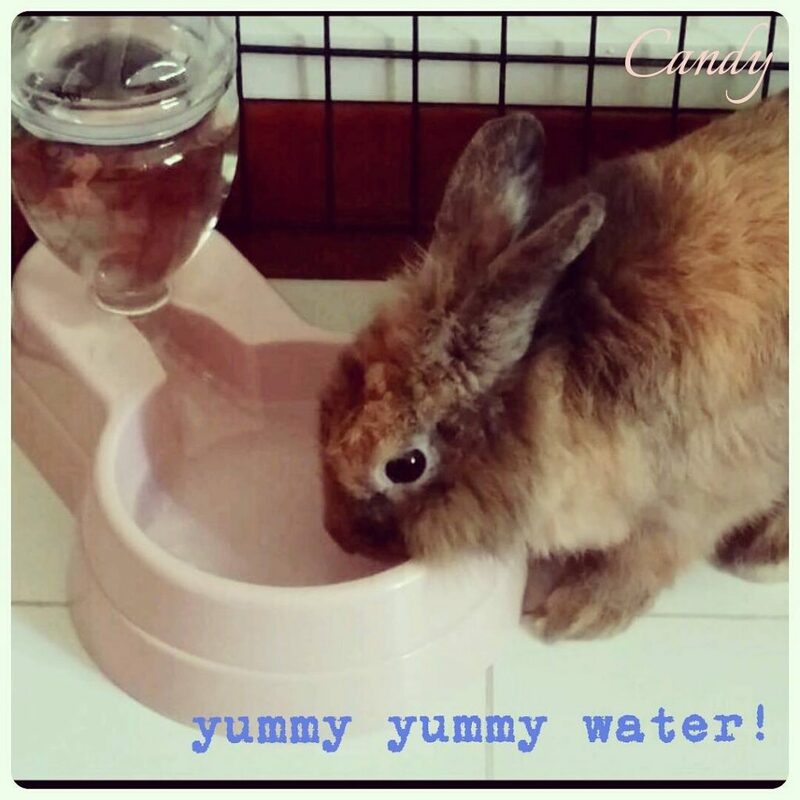 Our little Candy (adopted by Fion) just loves to drink her water to stay pretty! We hope all bunnies are staying just as hydrated through this warm weather! Fresh water is essential to a rabbit’s healthy diet. A rabbit should drink between 50-150 ml of water/kg of their weight every day! If a rabbit doesn’t drink enough, it can cause a sluggish urinary system and in severe cases, a heat stroke. – Skin will become dry and lose its bounce. You can test by grabbing the neck skin and gently pull it up. On a health animal, it will go right back. For a dehydrated animal, it will sink slowly or stay still. If your rabbits display any of the above signs, do consider a vet consultation. Subcutaneous of fluids or even a urinalysis can be performed at a reasonable cost. – Soak the vegetables in water for 10 minutes before serving. Serve the fluid-filled stems first, then the leaves. – Give fresh fruits such as watermelon, grape and apple as treats. Be sure to remove any seeds. – Flavor up their water to encourage drinking. Mint leaves, apples, even ice cubes can be popped into their water to entice them. – Few drops of cranberry extract can sweeten things up as well as protect their urinary tract. – Place more water bowls around the house for a lazy rabbit. – If you are using a sipping bottle, consider a bowl or a water bottle like what Candy has. The former is really quite tiring to drink from. – Consider filtered water, boiled water or distilled water for your bunnies. This reduce minerals in their urinary tract and prevent sluggish buildup. We hope with the above sharing, we can help our bunnies stay hydrated and keep them healthy! So, DRINK UP, little bunnies!